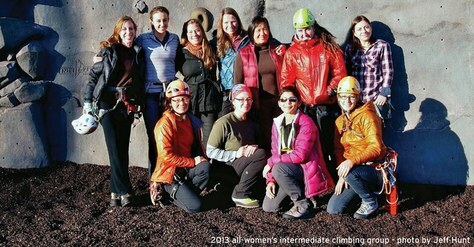 In 2013, The Mountaineers offered their very first all-women's intermediate climbing group, led by Stef Schiller. Eight years ago, Stef Schiller was clinging to the side of a rock face. She was leading a section of Saber, one of Leavenworth's classic moderate multi-pitch routes. She was terrified. As part of the Mountaineer's Alpine Intermediate Climbing Program having only ever led one pitch of 5.4, she was mentally and physically unprepared for "the sharp end." Topping out, Stef had two thoughts: "I had miraculously survived, and I was never going to do anything insane like that again." Today Stef is one of the Mountaineer's most accomplished climbers. She is an Intermediate graduate, a climb leader, course leader, and currently heads up The Mountaineers Advanced Climbing Program. Stef has led major classics all over the U.S. including many of the 50 Classic Climbs of North America. She regularly masters 5.12 in the gym and has climbed challenging lines in Yosemite, Red Rocks, the Grand Titons and, of course, the Cascade Range. It took many years and a dedicated mentor who believed in Stef to get her to lead again. It took a mentor who wouldn't let her stop, and who helped her to overcome her fear of leading. Stef credits her mentor Jessica Todd for much of the transformation that took place between now and that first lead on Saber. Stef met Jessica at a Mountaineers 'Women of the Hills' event. It was through their joint effort to bring female climbing speakers to The Mountaineers (Steph Abegg in 2011 and Steph Davis the following year) that the two women became friends. "Jessica was the most advanced women climber I knew at the time." When Jessica invited Stef to climb Outer Space (5.9, 6p) and encouraged her to lead the challenging finger crack, the two bonded a mentoring relationship. Through multiple climbs and many mountian experiences, Jessica helped Stef manage her anxiety and to overcome her fears. "She encouraged me to push my limits and provided opportunities that would have been hard to come by otherwise." "Without her, I would have dropped out of the Intermediate class — and The Mountaineers," Stef said. This year, Stef decided to give back by leading an all women Intermediate Mentor Group. This entails countless hours of mentoring and leading 14 or more women in skills practice, instruction, and experiences both in and out of the mountains. For Stef, it's all about building connections and providing opportunities for women. In a male dominated sport, Stef maintains, it can be harder for women to make the connections that men seem to make more easily. Women need opportunities to be rope leaders, to have mentored leads, to do challenging ice and rock routes, and feel supported when pushing themselves to reach their climbing goals. Growing female climb leaders and fostering women to women connections, friendships and climbing partnerships is something Stef is passionate about. The mentor group she says "is not against men." After all, her favorite climbing partner and biggest supporter is her husband, Jeff Hunt. The group is about "opportunities — including the opportunity to network with other women - so that we become more likely to succeed." The next time you climb Saber (or any climb sponsored by The Mountaineers), look around for more women climbers and leaders. Thanks to Stef, we'll likely be seeing more female Intermediate Graduates and women Climb Leaders.